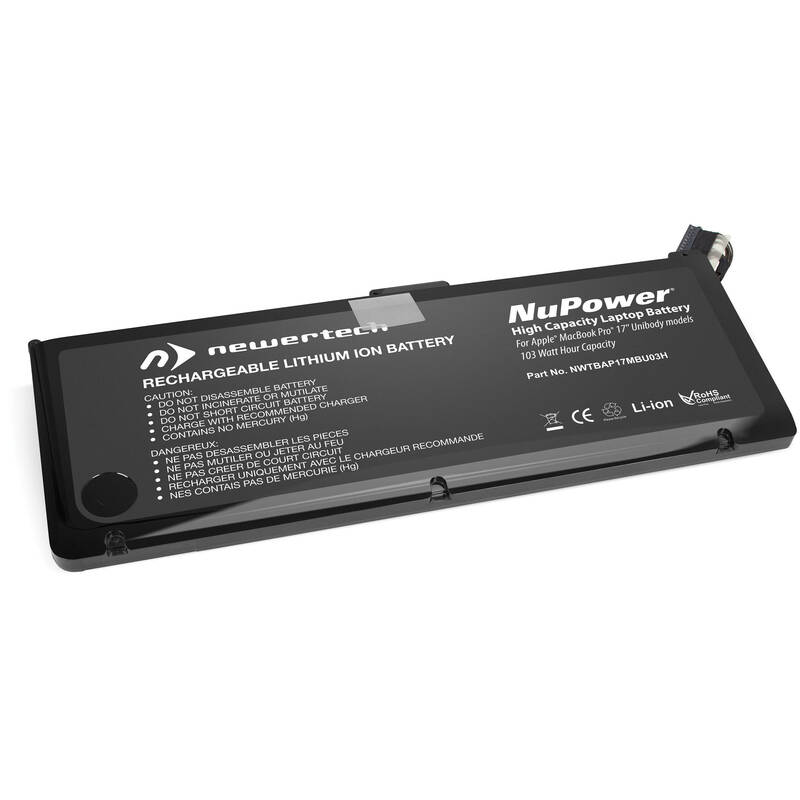 The NuPower Replacement Battery for MacBook Pro 17", Early to Late 2009 & Mid-2010 from Newertech is designed to meet and exceed factory specifications. With a renewed battery life, you can listen to music, watch videos, and get more work done between recharges. The battery is environmentally responsible and is RoHS certified to be free of lead, mercury, cadmium, PBBs, and PBDE. Box Dimensions (LxWxH) 13.0 x 6.0 x 1.3"
NuPower Replacement Battery for MacBook Pro 17", Early to Late 2009 & Mid-2010 is rated 4.2 out of 5 by 21. Rated 5 out of 5 by Ronald from Great Battery The NuPower Replacement Battery for MacBookPro 17 Arrived in its well packaged parcel. I followed instructions and the battery was very easy to install. After charging the new battery, I began using it without external power and it held up very well. It actually lasted longer than the original battery when it was new. After replacing the 2.5 5400RPM HD with a 1 TB SSD, it performs even better than ever. I am extremely happy with this new battery from NuPower for my mid 2010 MacBookPro. Rated 5 out of 5 by Ronald from Excellent Replacement Battery I use my mid 2010 17 MacBookPro on a daily basis. I use it as the primary computer for my business and it is powered on for most of the day every day. I received my NuPower Replacement Battery a few days ago and so far I have not had to charge the battery until I quit using the computer until the end of the day. The installation was as simple as could be. Remove the ten screws, remove the bottom plate, unhook the old battery power connector from the computer. Remove the three screws holding the old battery in place. Remove the old battery and place the new NuPower battery in the proper position, re-inserting the power connector, inserting and tightening the three screws holding the battery in place. re-installing the back cover with the ten screws and then starting up the computer. Resetting the clock and date and done in less than ten minutes. The battery even runs cooler than the original. Rated 5 out of 5 by Christopher from So far so good It's only been a So far it lasts nearly 3 times longer than the original that was worn out. Easy to install, all the tools needed are in the box. Be sure to look up the OWC battery calibration video for this battery on youtube so you properly calibrate the battery after install. It takes about 16 hours to properly calibrate it and you can use the computer (light duty use) for all but 5 of those hours. I just scheduled it so the 5 hours were overnight. Recycle your old battery and you are all set. Rated 5 out of 5 by Amber from Good replacement battery for my 17 Mid 2010 MacBook Pro I bought this replacement battery for my MacBook Pro (17-inch, Mid 2010) after my Mac stopped working with the original battery. The lap top would only work (and not very well) when attached to a power source. I was happy to find that it fit perfectly after reading some reviews that said that it didn't. It was easy to replace and came with the tools. I can now use my lap top without it being plugged in which, turns out, is pretty handy. Rated 1 out of 5 by Chris from Does not fit mid-2010 model The adapter on the battery that connects to the laptop logic board is considerably smaller that the Apple version, so the battery does not remain connected to the computer. I fixed it myself my wedging a doubled over corner of my business card to keep the plug snugly in place, but this seems like an absurd and potentially dangerous solution. Also, the fabric cover pulled off almost immediately. You'll see the frayed fabric and the size difference in the included photo. I wouldn't recommend this product. Rated 5 out of 5 by Juan Padin from All you need inside Its an excellent product. You will find 2 screewdrivers and very easy intructions inside. Im using the battery right now and it works very well. Rated 5 out of 5 by CMANIA from BEST BATTERY ON THE MARKET EASY TO REPLACE. NO ERROR MESSAGE. BOUGHT 2 DIFFERENT BRANDS FROM @ AND RETURNED BOTH. PAY THE EXTRA MONEY FOR THIS ONE.